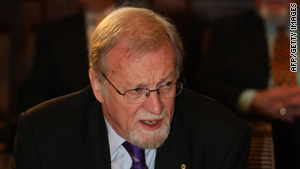 Gareth Evans co-chairs the International Commission on Nuclear Non-Proliferation and Disarmament. (CNN) -- A former Australian foreign minister said Wednesday he was encouraged by exchanges "across the room" between Israeli and Iranian representatives during a meeting both attended last month. Representatives of the two countries commonly make it a point to avoid being at sessions attended by the other, but last week, the Israeli daily newspaper Haaretz, quoting the Israel Atomic Energy Commission, reported that the two countries both had representatives at a nuclear non-proliferation conference in September in Cairo, Egypt. IAEC spokeswoman Yael Doron, the newspaper reported, said that "no dialogue or interaction" occurred between the Israeli and Iranian representatives. And an Iranian Atomic Organization spokesman called the reports "sheer lies" and denied that there had been a meeting in Cairo, Haaretz said. But Gareth Evans -- a former Australian foreign minister who is now co-chair of the International Commission on Nuclear Non-Proliferation and Disarmament -- told CNN's Christiane Amanpour on Wednesday that not only had a meeting taken place, but "there were sufficient exchanges across the room in the presence of 20 or 30 others to give me some encouragement that we might just be beginning to find the possibility of a dialogue that will get us towards where we want to go." He added, "What we're looking at is exploring, for example, the preconditions for a 'weapons of mass destruction-free zone' in the Middle East." While such an arrangement is unlikely any time soon, he said, "getting each side to articulate what its concerns are, what it will want as a precondition, is important, and I think we made a small step in that direction." Western nations believe Iran is trying to build a nuclear weapon, while Tehran says its program is for peaceful purposes only. Meanwhile, independent analysts believe Israel has up to 200 nuclear warheads. Israel refuses to confirm or deny the existence of a nuclear weapons stockpile. Evans did not give any details of the September 29 event in Cairo. He said he could not confirm or deny anything that was said in the room because that was part of the agreement that brought the Israeli and Iranian representatives to the event, along with representatives of other countries. Looking forward to the possibility of a long-term deal to curtail Iran's enrichment of nuclear material, Evans said, "It's not going to involve the complete abandonment of the enrichment capabilities with fissile material, but I think it can involve very serious disciplines on the misuse of that material. And I think there's every chance that we're seeing the beginnings of a quite serious process of accommodation by Iran, notwithstanding all the internal difficulties." He also expressed optimism about the prospects for a global deal to sharply reduce the number of nuclear weapons in the world, perhaps even to zero. "We can sure as heck get very close to zero within a finite timeframe, I think, in the next 15 years or so. We can get down to a world which has roughly about 10 percent of the stockpile of nuclear weapons that exists at the moment," he said. "To get to a world in which there are very low numbers, where nobody is relying seriously on nuclear weapons as any kind of security vehicle for their either defensive or offensive aspirations, and a world in which these things, such as they are, are actually locked away and not on trigger alert and so on, would be a very much safer world than the one we have at the moment." CNN's Tom Evans contributed to this report.